Even though it may be something of a chore, it’s probably best to do an attitude adjustment and consider work on the final drive chain more as a “labor of love.” That’s because a properly selected, installed and well-maintained chain can give you loads of miles to love. Simple as it may seem, modern motorcycle drive chains are a far cry from the older, simpler days of implement-grade roller chain technologically not much above bicycle chain. Modern drive chain is precision-manufactured using ultra-high strength materials and with design features that make lighter, more durable and much easier to live with than the older chain types. Modern chains, for all their similarities and apparent simplicity, are not a one-size-fits-all proposition. EK Chains, for example offers no less than 22 series of their product for six applications (off-road, motocross, ATV, street, drag race and road racing). So, when the time comes for chain replacement, there are quite a few options in terms of performance capabilities and special features that may be worth considering. Of course, the most direct approach is to replace the original drive chain with an identical product – but that may not be an option if the original make or model is not available for any reason. That approach may also leave the latest technology product that could offer superior performance on the shelf. There are a number of dimensions and terms that are useful to know about drive chain when making the selection, and we’ve put some of the essential ones on the accompanying illustration. Of course, a person doesn’t need to become an expert in chain technology and jargon to pick out a new drive chain, but a little familiarity with the basics can help prevent problems along the way. And, of course, most motorcycle dealers and parts vendors have staff and technical materials available to help out, as well. Dimensions may vary somewhat from product to product and other dimensions such as pin diameter, link plate thickness and height, color, finish and tensile strength may vary as well. Since it’s usually necessary and always a good idea to replace the sprockets when replacing the chain, the sprockets must be sized not only based on the number of teeth, but to match up with the chain size, as well. 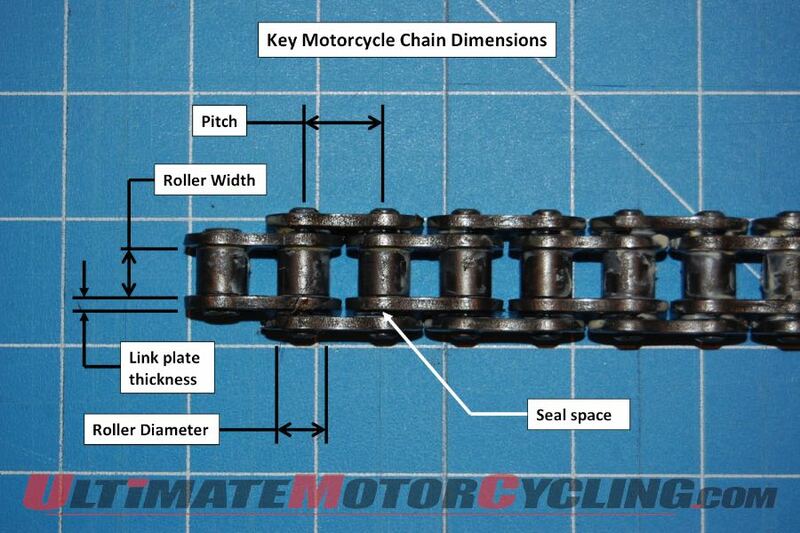 Motorcycle chain is designed for exceptionally high strength and long wear characteristics. Features like quad-staked riveting on the head of the pins for retention of the link plates on the pins, connecting link plates are press-fitted, link plates are thicker, rollers are of seamless material, pins with special low-friction coatings, oil-impregnated, seamless sintered bushings that extend beyond the inner link plates with O or X-ring seals combine to ensure greater strength and longer service life. Standard old-style roller chain requires regular cleaning and lubrication to achieve maximum service life — whether and how to lubricate O-ring and X-ring chains is dependent on the product, so manufacturer’s recommendations should be followed. In general, cleaning O-ring and X-ring chains should be done with some form of biodegradable degreaser and non-wire brush. Cleaning with some sprays, solvents, gasoline or benzene is generally to be avoided; cleaning, drying and re-lubricating the chain as recommended by the manufacturer is the best way to go. Signs of wear like kinks, stiff spots, missing or failing O-rings or X-rings, separating link plates, badly worn rollers, excessive stretch, corrosion, loose components, excessive noise or rattling while underway, and damage of any kind all may indicate the need for chain replacement. Contact with battery acid may require replacement of the chain in some cases and exposure to salt generally requires immediate cleaning to prevent corrosion and damage. Chain, master link and X-rings: This image shows the side view of the chain, master-link, X-rings, and lubricant for assembling a new chain on the bike. Since a chain failure can be dangerous as well as expensive and inconvenient, staying on top of the condition of the chain and replacing it before a failure can occur is essential. Checking for chain wear can involve careful visual inspection and measuring chain stretch by checking the distance across a set number of link pins against a set dimension, as a percentage of original dimensions, or by the old eyeball method of lifting the chain away from the rear aspect of the rear sprocket. The number of miles on a chain might be considered as a factor in chain wear assessment, as well, although that may vary widely depending on riding conditions and maintenance. Chain adjustment and alignment can contribute to longer chain life, as well as rider safety. If the sprockets are out of alignment, it can cause derailment of the chain, which in turn could lead to loss of control. Most bikes have gradients on each swingarm side to help maintain alignment, so when adjusting chain slack, it is essential to make sure the alignment marks match on each side. Follow your bike manufacturer’s specifications for both chain tension and how to ensure proper chain alignment. In most cases, checking for the need for chain adjustment and lubrication should happen about every 300 to 350 miles, but this can vary by chain type, operating conditions and manufacturer, so following the manufacturer’s recommendations is essential. While replacing a chain is not all that complicated, having the chain replaced by a trained professional is often a very good idea. Master link installation is absolutely critical and securing the master link can be accomplished by riveting (requiring special tools), screw type master link or clip-type. Installing the O-rings or X-rings and lubricating the pins goes along with proper installation so owner-installation should follow the manufacturer’s instructions to the letter. Stay clicked on to Ultimate MotorCycling for more information on chains, installation and maintenance in the future!